On site, we have a number of prototypese for sanitation, water and hgyiene. 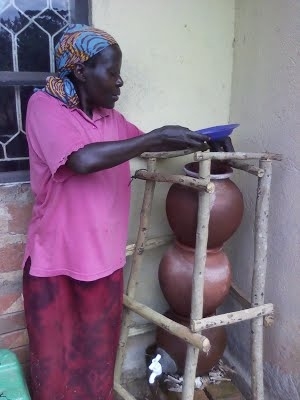 Saniation prototypes include; the UDDT (ecosan), Spiral toilet (using used plastic bottles). Water technological prototypes on site include; the 25000 liters underground tank constructed using the Interlocking Soil Stablizing Blocks (ISSB), the Ferrocement tank, plastic tank, collugated iron sheet tank all which can be used for rainwater harvesting. We also have different prototypes, for purify water; life straw, Tiva filter, ceramic filtern and SODIS among others. We have the tippy tap and the 2 liter device made of a used plastic bottle and a plastic pipestand. These are provisions for hand washing (hygiene). We also have on site prototypes for irrigation farming and these include; the drip irrigation bucket, treadle pump and money maker pump.